Velox is a swimming, skating, crawling robot that uses undulating fins to move on land, water and ice. For many years, roboticists have been building robots that mimic animals and their abilities. Many of these robots have been used to great effect in solving seemingly complex problems. While the effectiveness of bio-mimicry cannot be disputed, a major drawback of this method is that the robots created often inherit the limitations of the model animal. 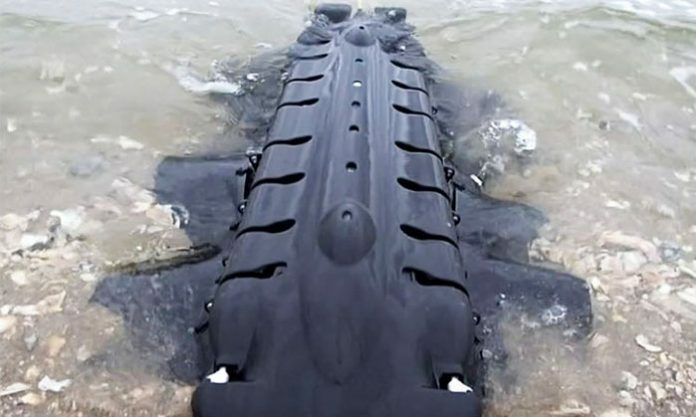 A robot that is designed to swim like a fish, for example, would find it hard to move on land. Invented by Pliant Energy Systems, Velox is a novel robot that gains strength from the limitations of bio-mimicry. The machine was developed as a result of research into renewable energy generated by waves. Unlike similar devices that come with spinning blades, Velox is propelled forward by its undulating fins. The device is equipped with an onboard CPU that transmits power to the actuators that are responsible for powering the fins. Velox can glide smoothly through water in this mode. Once it settles on dry land, the robot automatically swivels its fins at a right angle and props itself forward. This automated movement equips it to move over dry land. The manufacturers claim that the robot can smoothly negotiate sand, pebbles, snow, paving, and ice. Velox was only recently equipped with the ability to move on ice. As mentioned earlier, Velox was originally designed as a proof of concept. There is little information about the pricing on the Velox official website. You can get in touch with the manufacturing company via the website for more details.